In his 50 professional years, Tumbleweed has interviewed some true Texas characters and assembled the largest private collection of oral history in the United States. He writes a syndicated weekly newspaper column and teaches broadcasting at the university level. As the creator and producer of The Sound of Texas, one of the longest running syndicated radio programs in Texas, Tumbleweed seeks fascinating people who embody the spirit of the lone star state and brings them into the homes and hearts of thousands. Tumbleweed Smith of Big Spring is one of 35 honorees at the Brown County Museum's 35th anniversary celebration on September 18th. The 35 are being recognized for contributing to the historical legacy of Brown County. "His statewide syndicated radio program and newspaper column include many historical features on this area and around the state, educating the public about our amazing history," says museum board chairman Dion White. "He has had an impact on preserving our local history." The evening, titled "35 in 35," begins at 7 PM September 18th at the museum located at 209 Broadway in Brownwood. "We will be expressing our appreciation to 35 people and entities who have played a role in valuing and promoting this rich heritage," said White. Tumbleweed's program, THE SOUND OF TEXAS, is in its 50th year. Tumbleweed Smith's radio program, THE SOUND OF TEXAS, began its 50th year on the air August 1st of this year. "It was an experiment in free enterprise to see if I could make a living doing what type of work I enjoyed most: reporting on the fun people, places, legends, folklore and history of Texas," says Tumbleweed. "I've interviewed nearly 13,000 characters, storytellers, musicians, writers, poets and interesting individuals so far and feel I've barely scratched the surface." Tumbleweed is a trained journalist, earning a BA in English from Baylor and a MA in Journalism from the University of Missouri. He has won several international awards for his work as a reporter. He has been recognized by both the US and Texas legislatures for preserving history. When he started the program on August 1st 1969 he wanted to report on the things that make Texas what it is, which he felt were being overlooked. For the past 32 years, Tumbleweed has written a weekly syndicated statewide newspaper column. Before starting his program Tumbleweed had worked in radio and television news in Big Spring, Houston and Des Moines, Iowa. "What I liked most about doing the news was getting the newscasts ready and putting the news items in a logical order. Late in my news career I decided that there were plenty of people doing news. I wanted to report on real life." . Tumbleweed Smith, newspaper columnist and radio producer, has won a Gold Award of Excellence from the Communicator Awards, which this year received over 6,000 entries, making it the largest and most prestigious award of its kind. He will receive a gold statuette made by R. S. Owens, producer of the Oscar and Emmy awards. Tumbleweed was recognized for an audio documentary he produced last year for the Texas Jewish Historical Society titled TEXAS JEWS GO TO CUBA, based on a humanitarian trip the group took to the island nation last year. 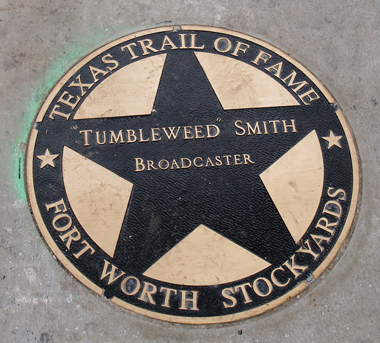 Tumbleweed Smith of Big Spring, newspaper columnist and producer of The Sound of Texas radio series, has been inducted into the Fort Worth Stock yards Trail of Fame. The organization recognizes individuals who have made major contributions to the creation and preservation of our western way of life and western heritage. The program has recognized 130 individuals since its inception in 1997. Each fall the Texas Trail Board of Directors announces new inductees and installs a beautiful 24-inch bronze marker bearing the honoree's name on the walkways of the Fort Worth Stockyards National Historic District. The 2013 Texas Trail of Fame induction program will took place October 26th in front of the Exchange Building located at 130 E. Exchange Avenue in the Stockyards. Other inductees are Perry and Nancy Lee Bass, General William J. Worth, Leon Coffee, Santana, Jim Thorpe and John Avery Lomax. 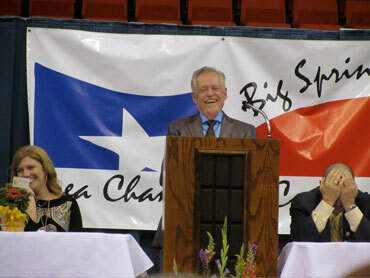 Broadcast personality Tumbleweed Smith, who has one of the most recognizable voices in Texas, started out with an ambitious goal. "I want to see everybody, go everywhere and do everything," he said. And he's just about done exactly that over a 45-year career of condensing Texas and Texans into two-minute sound bites. And Rockdale is glad. More than 80 persons packed into the city library Thursday evening to hear an in-person sampling of Smith's "The Sound of Texas," the radio program that's heard daily on 200 stations, including Rockdale's KRXT. LOCALS-Smith, whose real name is Bob Lewis, has been to Rockdale and Milam County many times and interviewed numerous "characters" for his show. He counts former Rockdale resident Jo Bird-now living in Indiana-as a personal friend. "I've interviewed her five or six times," he said. "I think I'm up to 14 cuts with her from those interviews." He singled out Joan Ratliff, Rainbow Courts owner who was in attendance. Ratliff was in a recent interview. Smith and wife, Susan, stayed overnight at Rainbow Courts. "That is our favorite place to stay in Texas," Smith said. Smith had the appreciative audience in the palm of his hand from his opening remark. "I've talked all over the U. S. and in two foreign countries, Canada and Arkansas," he said. He emphasized communication as a key to what he does. "There was a lady who pulled into a service station and asked the attendant if they had a restroom," Smith said. "He misunderstood, thought she had a dirty floorboard and had said 'whiskbroom'." "So he told her, 'just pull up a little bit and we'll blow it out with the air hose'," Smith said, as the audience wiped tears of laughter from its eyes. CUTS-Smith played 15 cuts from his radio interviews that ranged from Elvis Presley's hairdresser to a journalist who claimed he had "a face for radio and a voice for a magazine." Many sound cuts were longtime favorites of Smith listeners including cartoonist Ace Reid's story of a pilot who tried to kill a rattlesnake while landing his Lear jet and a friend of "Hee Haw" humorist Grady Nutt relating the night boys from Jacksonville High School moved a "We Fix Flats" sign to Margie's Brassiere Factory. "I'm always looking for people to interview," Smith said. "I've never been desperate for one, but I'm always looking." COUNTIES-Smith probably knows the roads of Texas better than anyone. His show was around long before today's highly successful television "magazine" shows like "The Roads of Texas" and "Texas Bucket List." In fact, during the Texas Sesquicentennial year of 1986, Smith did one radio interview in each of the state's 254 counties. How did he find someone in Loving County, smallest in the U.S.? Its population is 82, less than the number of people in the city library Thursday. Somehow the name of that interview 29 years ago floated up into his mind. "Jimmy Wheat drove a Rolls Royce," Smith said. "And he kept a cow in the back seat." "He used that car like a pickup truck," Smith continued. "He took it to the Rolls Royce dealer and the guy said, 'whew! you must have run over a stump or something'." Smith's sound technician for the Rockdale program was his wife. 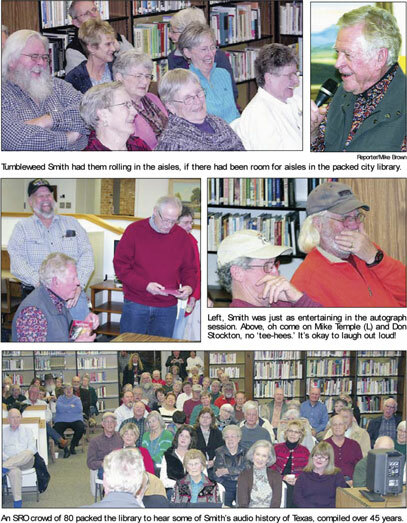 He remained at the library until its closing time visiting with well-wishers and signing copies of his latest CD, which contains a number of his favorite stories. It is believed Smith has gathered the largest private collection of audio history in the United States. 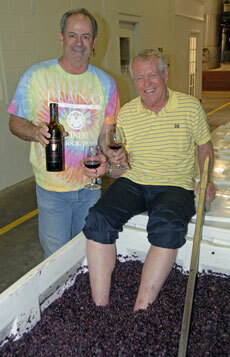 at Llano Estacado Winery with winemaker Greg Bruni. 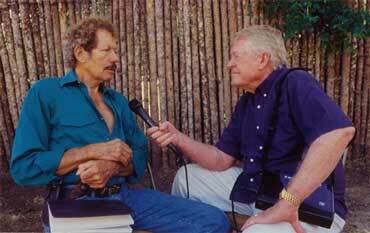 Tumbleweed Smith interviewing artist Bill Worrell. A collection of true stories and a few tall tales told by the people who tell them best. These comical and often outrageous stories are certain to become Texas legends. 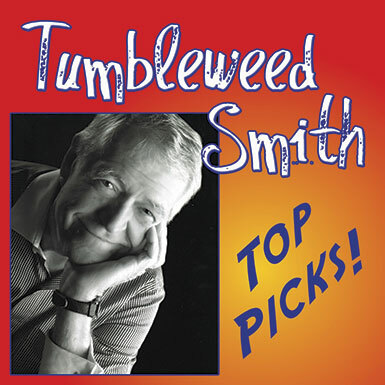 Tumbleweed Smith featured in Interviews & Write-ups in Texas Highways, Texas Hill Country, and The Rotarian. Read the Midland Reporter Telegram's "Person to Person: 20 Questions with Tumbleweed Smith."